J.T. asks: Can you identify this medal? You have a 1976 Chaing Kai-Shek 90th Birthday medal. weight=17.4 grams .750 silver or .4195 of a troy ounce of silver. These were privately produced both in silver and gold. The silver version brings about $25 in the numismatic market. 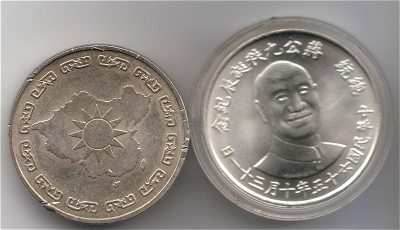 There are an entire group of medals produced from about the 1960’s through 1986 that feature a portrait of Chaing Kai-shek and commemorate the Republic of China or Chaing’s birthday. These are known by collectors as the “Chaing Kai-shek Series”. 1809 Mexico Portrait 8 realesWill the U.S. Mint ever produce a silver coin again?